Yes, I went MIA last week. Two words: Finals Week. It’s amazing how quickly you forget the “joys” of the end of the semester after graduating from college. And it’s amazing how quickly you remember them, too. I dare you to say “Merry Christmas” without smiling! Okay, I realize you can physically say “Merry Christmas” without actually smiling. But humor me for two seconds. Last week was the final meetings for my classes, so for one of them, we had a little Christmas party. 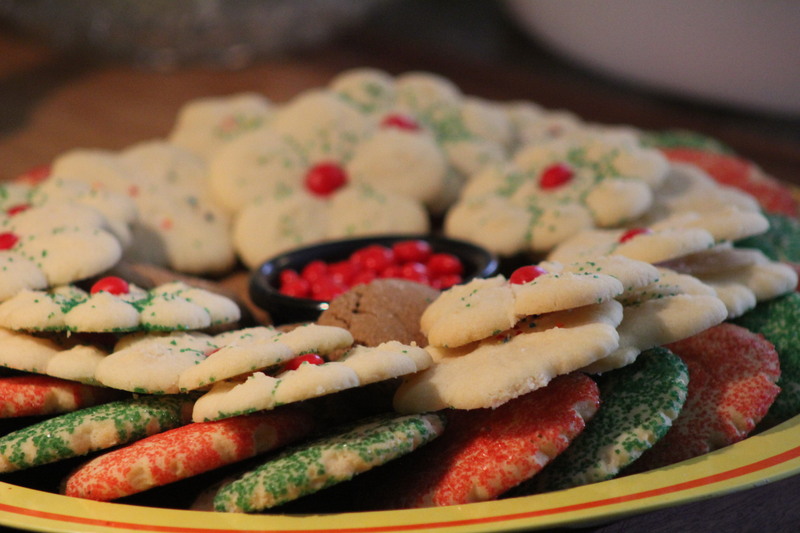 I took some Christmas cookies, because you can’t not have a good time when there’s cookies in the room. (Yes, they were homemade. Yes, they were yummy. Yes, you can call me Betty Crocker.) We didn’t eat them all during class, so when I went to the library afterwards, I decided to spread some Christmas cheer. I offered librarians and random students cookies (“Christmas tree, wreath, or snowflake?”) and added a delightful “Merry Christmas!” to go with it. I couldn’t help but smile when I said Merry Christmas. It may have even cheered me more than those who got cookies! Maybe it was being done with classes, maybe it was the act of giving, I don’t know. But those words—Merry Christmas—felt so good to say. Sorry, folks. “Happy Holidays” just doesn’t cut it. It’s just not the same as saying “Merry Christmas.” Try it. Try saying “Happy Holidays” with as much joy and fulfillment as when you say “Merry Christmas.” Can you tell a difference? In my next post—those politically-correct-greeting wars! Brought to you by whoever wrote “Merry Holidays” on a classroom board last week. Great job! Even though our family quotes the movie frequently, “Santa’s coming. I KNOW him,” I’m tired of Elf. Every time I thank the cashier this holiday season, I always say Merry Christmas before they have a chance to say whatever it is the store policy wants them to say. Almost invariably, I get a big smile and the person wishes me a Merry Christmas too. It’s my little way of pushing back against political correctness, and the cashiers seem to get the point––and enjoy it.